Use this technique to create increadable realist and delicate castings for display. 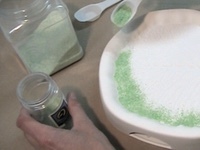 Create extremely thin and delicate art pieces by casting powdered glass at extremely low temperatures. The Slab Server design is a perfect format in which to experiment with billets, reactive glass, kiln carving, and powder printing. The integrated feet makes for elegant results. Create feathers that are as fanciful or realistic as you like with Colour de Verre’s Feather design. 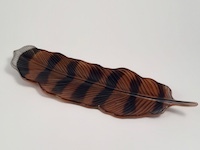 Once feathers are cast, they can be slumped into amazing decorative or functional pieces. Our Snowflakes ’12, ’13, ’14, ’15, ’16 and ’17 molds produce light and delicate snowflakes that celebrate the austere beauty of winter. 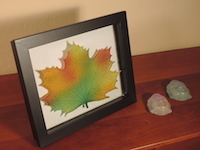 They can be hung most anywhere and make the perfect “little gift” for friends and coworkers. If you want, you can tack fuse them to holiday plates and platters. Perfect way to brighten winter days. They also make perfect gifts. 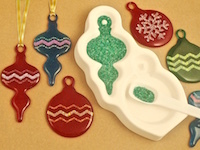 Create your own keepsakes with our Vintage Ornaments design. They also make perfect holiday gifts. Produce either edgy or classic pieces with our Big Skull design. It is a great way to learn about using glass billets. 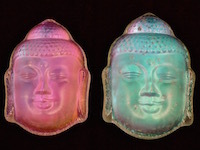 Our Buddha Faces are serene and contemplated images that seem to radiate calm. 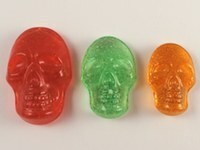 They are easy to make and our mold makes them two at a time. 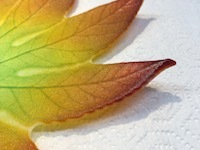 Use them to embellish edgy platters, plates, and candle holders. Or, let them stand alone as jewelry, objets d’art, or “worry stones”. Brilliant results in just one firing. 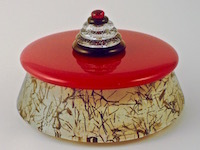 Perfect on the vanity for soap, or on the dresser for change, rings, or jewelry. 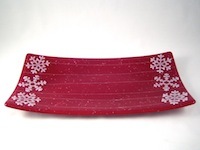 Learn how to make Colour de Verre Snowflakes. 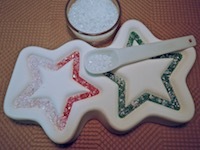 Snowflakes are an easy project and only require one firing. 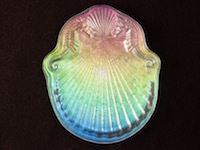 Craft whimsical plates reminiscent of antique majolica ware with this wonderful design or, if you are ambitious, create impressive platters, bowls, or wall art. 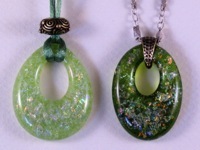 Produce small, delicate, but attention grabbing pendants by combining these two designs with dichroic glass flakes. 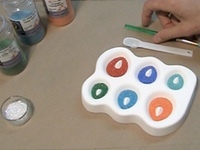 This technique can be used with any of Colour de Verre’s pendant designs. 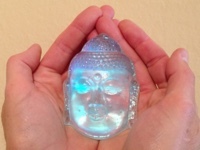 Learn how to cast our Buddha Faces and then back the casting with dichroic sheet glass to product faces that almost glow. This video illustrates a great technique using our molds and dichroic flakes to create really spectacular pieces. 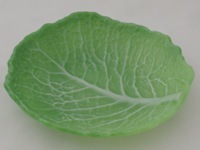 See how to make a realistic Cabbage Leaf - step by step.